How do you feel about New Year’s resolutions? Does the thought of setting them depress you or make you anxious? Or maybe you start out all gung-ho right after the ball drops, but come February 1st you’re already off the wagon? If you’ve been following my work for a while, you know I do an annual ritual in lieu of making New Year’s resolutions. Resolution setting has never really worked for me…I’d make a goal that was too big or too hard… and when I didn’t follow through, I’d end up feeling like a failure. Creating resolutions doesn’t really give you any space to process the year that just happened, which is essential if you want to consciously and intentionally leave any of the crap you don’t want in last year. I knew I needed to create something different that felt really good for the start of each year. Some simple practices to help me not only create space to understand the difficult situations I’d gone through that year, but also to help me celebrate the great stuff too. So today, I share that ritual with you. If you want to head into 2019 with clarity on what you’re ready to release and confidence around what you’re ready to welcome in with a ritual practice that feels goooood, then this episode is for you! The first step is to create some lists. You start by making a list of all the crap you’re leaving in 2018. I’ve created a PDF for you with this ritual that will walk you through the process as you make your lists and you can download it right here. That consists of people, places, things, experiences, feelings– anything you don’t want to carry with you into this New Year. Take about 10 minutes and think through all the different areas in your life that were stressful, painful, unsatisfying or just plain wrong in 2018 and write them down. You might feel some resistance to this, but I promise you, it’s this kind of reflection that will help you process the crappy stuff so that you can make conscious decisions about what you do want your life to feel like and be like this year. Life is an ongoing journey of higher education — I’ve learned so much and just when I think I couldn’t possibly learn more, I do. This is a great journaling exercise so be specific! This can cover all areas of your life – home, relationships, work, finances, friendships, health – anything that you feel needs to change. This isn’t an exercise in negativity, this is about identifying what worked and what DIDN’T work, and getting clarity about where you want your life to feel better. As I said before, I do this practice each year and each year I end up with a long list of the things I’m leaving in the previous year, and it feels very hopeful and exciting. Once you’ve got your first list complete, it’s time to move on to the next one: Gems from the Crap in 2018. This is a great way of REALLY getting to the bottom of what you learned from those circumstances that didn’t go the way you wanted them to. Look back at your first list and really try to extract the wisdom or learning from each of those situations or experiences. While some of those can and will be painful to re-examine, this is how we as humans learn and grow – instead of beating yourself up or living in regret, we focus that energy on gleaning the wisdom from those not so great events. It’s an essential practice because if we don’t learn from our behavioral choices from the previous year, what do you think happens? We repeat them. I don’t want that for you! I know that you’re strong enough and smart enough to do the work: you wouldn’t be reading this if you weren’t! Commit to getting your hands dirty and digging through the crap of 2018 to find those gems so that you can continue on your personal evolutionary path of becoming the best version of yourself. List three is where it gets really fun. This list is about what you are creating in 2019. Now that you have established in the first list all of the things you DON’T want in 2019, write down on this list how you WANT to feel, and what positive changes you want in your life. As my pal Danielle LaPorte says, this is where we create our Goals with Soul. Get clear on what you want, based on how you want to feel. I’ve included space for this in the Ritual PDF, but If you want to go even deeper, I highly recommend her book, The Desire Map — it’s absolutely brilliant and walks you through the process of identifying your “core desired feelings” so that you can shift the life choices you make so that what you’re creating this year aligns with your authentic desires. Negative feelings give out negative vibrations that are like little hooks drawing in similar negative experiences, which is why – while we always want to acknowledge the lesson and be in action to change the things that aren’t working in our life – we always want to focus on the good stuff we want in our lives, focusing on what we DO have rather than what we don’t. So this burning is a very powerful way of re-affirming to the universe that we are done with the unsatisfying or painful experience/emotion/circumstance, and freeing ourselves of it. Now CELEBRATE – feel liberated and lighter and share your joy with us in the comments below or with your friends. Every time you read your lists of positive intentions, try to really FEEL the emotions you want to create. It’s not enough to just see the list – take the time to really imagine the good feelings behind each item on your lists. That way, by taking positive action AND consciously conjuring the feeling of achieving it, you create a really impactful way of making these things manifest for you in 2019. If more love is one of one of the things you’re manifesting for the New Year, I want to invite you to a brand new More Love Meditation Experience! I’ve created 10 new guided meditations for you based on our community’s feedback on what your biggest love challenges are, and they are just gorgeous. Each day you’ll get a new meditation from me right in your inbox and then we’ll conclude with More Love Live, a free training class where I’ll teach you my best tools and strategies to help you up the love in your life! Whether you’re single and want to attract healthy, lasting love or you’re in a relationship and want to create better, higher level love and intimacy, this experience is for you. I cannot wait to see what magic you create in 2019! As always, take care of you. 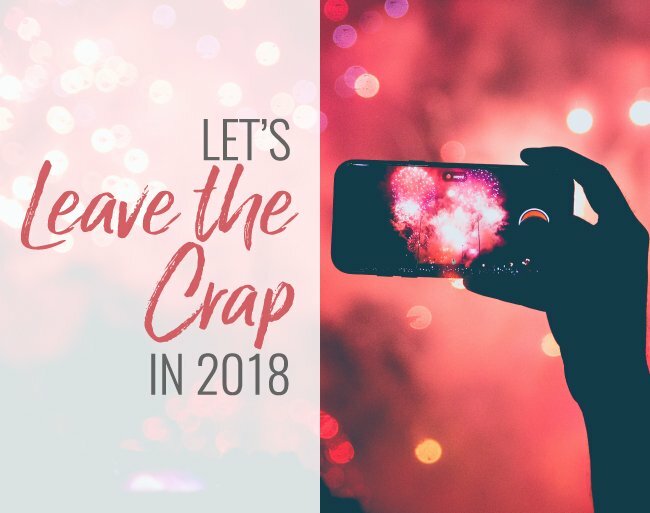 Let’s Leave the Crap in 2018! Single or Partnered: How to Make 2019 Your Year of Real Love! I will do this! 2018 has been the worst year for me. I want to leave the crap. My kids have moved out and I have moved to a smaller apartment. Lots of crap (clutter) is leaving the home. I have read Marie Kondo’s book and now I want to get rid of everything! Psycological stuff will be decluttered, too. I will change my life for the better. Let go of everything that weights on me. I really look forward to it. And the burning bit will really feel right. Thank you! Sounds like a great plan Maria! Wishing you a bright New Year! Awesome video! I love rituals like this that allow us to really reflect, accept, and grow better as individuals. Doing this at the end of the year is so super helpful. I personally stopped making “New Year’s Resolutions” many many years ago because, like you, they just never worked out for me and left me starting the new year more depressed than I was the previous year. However, I really like this approach you shared in the video about the ritual because it really covers all the aspects of really reflecting on the past year, accepting the choices we made, and determining to become better going into the next year. Plus, acknowledging the gems from crappy situations can really help us to let go of the situation itself while holding onto the lesson learned. Right on, Aricka! Thank you for reading and for commenting. I’m glad you’re here. Wishing you a Happy New Year! I would like your thoughts about Empath careers when you get the chance. I recently viewed your YouTube video about Narcissistic mothers, because my mom was one; she was the neglectful type. She passed away when I was 19; I have since gone through years of therapy. I was a Co-Dependent but now I am not; I set boundaries, I trust myself, and I have healthy relationships. I have found peace with my past and now I am ready to attract more “wealth” in my life. I am an Empath; I still attract Narcissists but then they back off when I stand-up for myself in a civil manner. When I write about my experiences with Narcissists it helps me cope, and sometimes writing helps me take action against them when it is necessary. Now that I am more confident I would like to start a business part-time. What roles do you recommend for Empaths and daughters of Narcissistic mothers? I would like to write others stories for them, as an Empath writer. I would also like to offer Empath support services, as a Life Coach. I can listen to others experiences with self-absorbed people unwilling to help them and offer options to develop a plan of action, if they would like. For example, my friends who have had negative experiences told me that they don’t know how to express themselves in writing; when something bad happens they do not know how to verbalize their feelings. I would work with them to put their concerns, emotions, and desires on paper. Then, I would offer civil actions he/she can take to resolve an issue. Would you agree that there is a market for helping others write about their negative experiences? If I build this business do you think it would encourage people to feel comfortable enough to start standing up for themselves regularly? What do you think? Thank you for your thoughtful question. I want to celebrate you for your personal journey to find peace and happiness for yourself after your experiences with your mom. Congratulation and way to go! It sounds like you’ve put some good practices in place to help yourself and others. Keep doing the work. It also sounds like you’ve given a lot of thought to your question about where you would like to take your career. Without knowing you personally, it would be hard to give tailored advice just as it would be difficult to say that all empaths would be suited for a particular career. It sounds to me like you’ve looked at your personal strengths and what makes you happiest, and it sounds like you’re going down that path. I would encourage you to continue doing what you’re doing in exploring the things you enjoy and where you find a good market to make the impact that you want to make. Wishing you lots of luck for your journey and sending you good vibes. I love the idea of this ritual and I definitely want to adopt it and do it every year. This was my first time seeing this video in your YouTube channel. Thank you so much for sharing all of these with the world. I wasn’t able to download the PDF after I sign with my name and email, is there another way to download? Hi Eliza. Thanks for joining us in this ritual! I’m glad you enjoy it and find it useful. Have you checked your email? We also include a link to download the PDF. Keep an eye out for the email with the subject line “Your Let’s Leave the Crap in 2018 Ritual Guide is Here!” Happy new year! Well Happy New Year Terri and all this wonderful community. Thank you for this ritual, I did it for the first time in 2017, and did it again last night to take me into 2019 with heathy energy and growth. The actual burning of the crap list is so important for me, as I know I can have the tendency to ruminate and focus on what is wrong rather than powerfully shifting my focus on what I have learned and what I desire. Your Real Love Revolution and Boundary Bootcamp tools have been instrumental in turning my life around this past 2 years. Thank YOU Valery!! So happy to have you here. And I am so glad the tools are helping you. Keep going, mama! You’re on a roll. Wishing you a healthy and happy New Year full of love. I love this! I’ve been trying to find a way to end the year and begin the new with a fresh slate and you have helped me achieve that!